Proper Standby is perhaps the most critical component for a successful cryonic suspension. Therefore, CI is pleased to offer an open-source Standby Manual to our members, as well as the cryonics community at large. Our goal is to provide a quality step-by-step guide that individuals and standby groups can refer to for planning and setting up their local standby efforts. 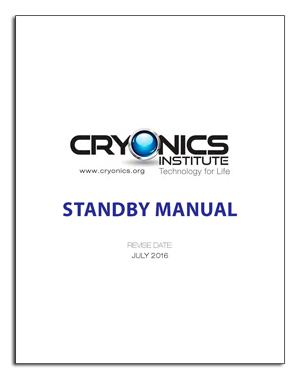 CI's open-source Standby Manual is the result of contributions from many members of the world-wide cryonics movement, to whom we extend our sincere thanks for their input. As an open source document, this manual is not intended to be the final word on standby, but rather a starting point and a work in progress. Please refer to the revision number on each page to be sure you have the most current version available, as we expect this manual will grow with future suggestions and contributions from the cryonics community. For details on how to purchase a pre-built BASIC or INTERMEDIATE Standby Kit from CI, please send an email to CIHQ@aol.com. Suggested prices for the kits are $400 for the Basic Kit, and $4,000 for the Intermediate Kit, plus shipping and handling. Please note, we do not currently offer an Advanced Standby Kit, however, this manual does offer a suggested list of equipment. This kit is in development, and based on interest, we plan to provide an Advanced Kit and / or detailed instruction series in the future. The Standby Manual provides detailed instructions and illustrations. Download a copy here or click the cover below. Please note, the following is a brief outline of the topics included in the Standby Manual. Be sure to download the manual for complete instructions. Information Packet containing instructions for early notification and simple instructions. Maps, contact phone numbers, and location of additional emergency resources and/or other useful documentation. Ice water containment for patient or Ice bath. i.e. Body bag, inflatable shower basin for head, or access to a bathtub for cool down. Basic CPR kit. Waterproof insulated gloves i.e. Ice fishing gloves for manual chest compressions. CPR Face piece with one way valve for ventilations. BVM (bag valve mask) may be better. A hand held Ambu-pump will facilitate much better CPS. Oral Airway may also help patient ventilation. Heparin 40,000 units, Syringe and Cardiac Needle. Additional useful items- Knee pad for kneeling on ground. Documentation supplies, i.e. notebook, pen, stopwatch. PPE Personal Protective Equipment, i.e. safety glasses, sterile gloves, mask, hand sanitizer, Bleach wipes and trash bag. Wrist watch. Trauma Shears to cut away patient clothing. Flashlight. Thermometer and probe with ear plug to insert into patients nostril to gauge brain temperature. Cellphone with pre-programmed phone numbers. Clearly marked equipment bag to contain kit. Make sure legal death has officially occurred before beginning cool down. Death can usually can be declared by a medical doctor but in some cases can be declared by a hospice nurse or a paramedic working under the direction and protocols of a medical doctor. Notify Cryonics Institute and additional resources. Immediately after death or as soon as possible begin cool down of the patient with Ice water. If ice is limited focus cooling to the head as a priority. Do not freeze the patient. Immediately commence CPS (Cardio Pulmonary Support). This can be done manually with a pair of insulated water proof gloves. If you have access to a Cardio Pump this will help to make CPS more efficient. Begin 30 compressions to 2 ventilations as per the AHA recommendation for CPR. Use of a mask with one way valve to give ventilations is recommended but a bag-valve mask may be better. Inject 40,000 units of heparin directly into the patients heart. If you already have IV or IO access from EMS you can use these ports for vascular access to inject the heparin. Flush with 20cc of saline and circulate with CPS. If the patient has been in cardiac arrest for greater then 15 minutes skip this step and focus on cool down. Beyond 15 minutes the use of heparin is not recommended or useful. Continue Ice water cool down and CPR for approximately 1 hour. Replenish ice as needed. At this point drain water and back fill the ice bath shipping container with patient and ice. Do not freeze patient. Deliver or Evacuate ice packed patient to Cryonics Institute immediately. Ensure that the patient is in a secure insulated container and has adequate ice to last the trip. If possible send an advocate with the patient to ensure prompt arrival to cryonics institute. *A useful acronym is I.C.E (Immediate notification, Cool down and CPS urgently, Evacuation to Cryonics Institute as fast as possible. Maps, contact phone numbers, and location of additional emergency resources and/or other useful documentation. Notebook, pen/pencil, stopwatch, Watch, for case documentation. Trauma Shears to cut away patient clothing. Flashlight and extra batteries for all equipment. Cordless screwdriver and manual screwdriver for Ziegler case screws. Cooler or Coolers with close by ice source, i.e. stocked freezer or list of 24/7 ice vendors nearby. A source of cold water. Ice bath, i.e. Ziegler case or rigid frame and waterproof liner for ice water and patient containment. In an emergency a bath tub can be used. Covers-Blanket or Blankets for insulation or patient movement, Body bag for ice bath back up, Patient moving tarp with handles,Tarp to cover kit or patient container. Manual CPR and Temperature kit Waterproof insulated gloves, Ambu-Cardio pump, Thermometer and probe with ear plugs for nostril placement. Airway kit BVM Bag valve mask for ventilation, ITD Impedance threshold device, Combs-tube or King Airway with air syringe and lubricant, Comfit to secure King Airway to patients head. Oxygen and tubing not necessary for cryonics purposes. Intravenous Fluids and tubing (Normal Saline) 1000ml Chilled IV fluids can help facilitate patient cool down. Automatic CPS device Lucas 1 or Michigan Thumper type compression device. Compressed air regulator to bypass need for medical grade Oxygen. 2 (Two) 1hour Carbon Fiber SCBA air tanks. Aluminum takes can be used but they are heavier and bulkier. The draw back to the carbon fiber tanks is 15yr life span. Ice water circulation pump and battery supply with hose and or squid system. Additional power connections and cord for ease of use. CI Medication Kit Heparin 40,000 units and Malox for stomach acid neutralization..
PPE Personal Protective Equipment. IE safety glasses, sterile gloves, mask, hand sanitizer, Bleach wipes and trash bag. Additional useful Items- Knee pad for kneeling on ground. Cellphone with pre-programmed phone numbers. Clearly marked equipment containers and bags to contain kit and sub kits. Smocks with name tags for professional appearance. Make sure legal death has officially occurred before beginning cool down. Death can usually be declared by a medical doctor but in some cases can be declared by a hospice nurse or a paramedic working under the direction and protocols of a medical doctor. Immediately after death or as soon as possible begin cool down of patient with Ice water. If ice is limited focus cooling to the head as a priority. Do not freeze the patient. Immediately commence CPS (Cardio Pulmonary Support). This can be done manually with a pair of insulated water proof gloves. Use manual Ambu-Cardio Pump at 30:2 rate while someone else sets up Lucas 2 CPS machine. Use BVM with preconnected ITD to give ventilations. Do not stop until Lucas CPS Machine is in place and running. Continue with ventilations. Obtain vascular access with IO Kit as first choice. If Patient has good veins and you have skilled IV technician then consider IV first. If no other access is obtainable use direct cardiac injection of medications. Also consider existing access such as a central line or pic line. Inject A. 40,000 units of heparin as the first line drug. Flush with 20cc of saline and circulate with CPS. If the patient has been in cardiac arrest for greater then 15 minutes skip this step and focus on cool down. Beyond 15 minutes the use of heparin is not recommended or useful. Place temperature probe in back of patients nasopharynx and secure with an ear plug. Turn on thermometer to monitor internal temperature. Connect and flow chilled Normal Saline 1000ml in IO or IO port. You may run up to 2000 ml of cold saline. Saline should be as cold as possible above freezing point. Place a King or Combitube Airway. Test unit, lubricate distal tip, insert down patients oropharynx (throat). Inflate cuff and notice device back out of patients mouth a few centimeters. Connect BVM and listen over epigastrum (stomach) and lungs to make sure of good placement. You should hear clear breath sounds in lungs when bagging patient. If not deflate, remove and start over. If positive placement confirmed draw up and administer antacid down esophageal portion of tube and into patients stomach. This will be the rear tube not covered by the BVM connection. Continue ventilations. Place Ice water pump in bath near patients feet. Connect and turn on pump. With gloved hand direct ice cold water near patients head. Continue Ice water circulation, Automatic CPS and ventilations until patients brain core temp reaches between 0 and 10 deg C. Approx 1 hours time with CPS and active circulation. Replenish ice as needed. You only want enough water to displace the air between the ice. A mostly ice wet slurry is best. At this point drain most of the water and refill the ice bath shipping container with fresh ice. Do not freeze patient. Deliver or Evacuate ice packed patient to Cryonics Institute immediately. Ensure that the patient is in a secure insulated container by wrapping sealed container with blankets. Make sure funeral home travel team has adequate ice to last the trip and or knowledge of 24/7 Ice resources along the way. If possible send an advocate with the patient to ensure prompt arrival to cryonics institute. Maps, contact phone numbers, and location of additional emergency resources and/or other useful documentation. Note book, pen/pencil, stopwatch, Watch, for case documentation. Trauma Shears to cut away patient clothing. Flashlight and extra batteries for all equipment. Cordless screw driver and manual one for Ziegler case screws. Cooler or Coolers with close by ice source. IE stocked freezer or 24/7 list of ice vendors near by. A source of cold water. Ice bath. 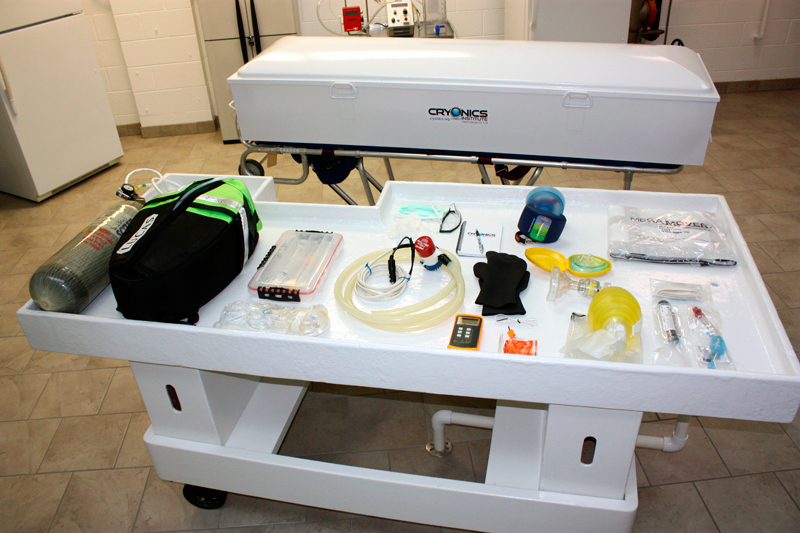 IE Ziegler case or rigid frame and waterproof liner for ice water and patient containment. In an emergency a bath tub can be used. 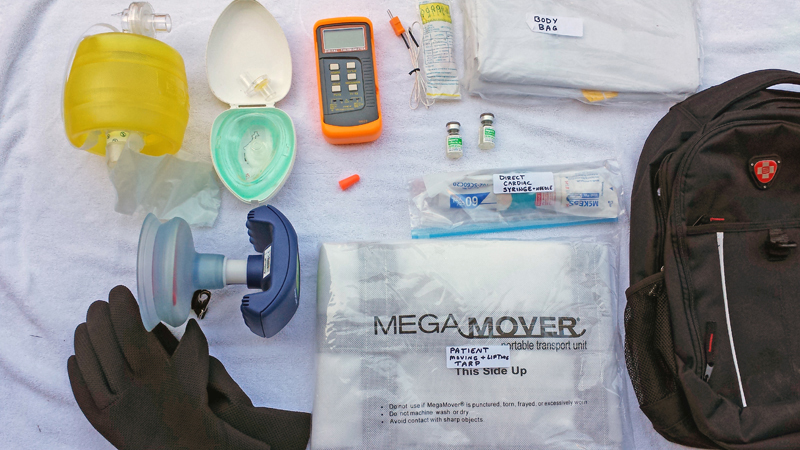 Cardiovascular Access kit to deliver medications and saline. 3 sub kits A. Direct cardiac access-60 CC syringe, Cardiac Needle, alcohol prep and band-aid. B. IO (intraosseous kit) Jamshidi IO needle, EZ-IO or Fast IO system. IO connection or IV extension link, 10cc Saline flush syringe, medical tape for stabilization and 4x4 sterile dressing. C. IV (intravenous kit) 2x 18,20, & 22gauge IV access needle catheter assortment, alcohol preps, tourniquet, Tagederm or medical tape, 10cc saline flush, IV extension or J-loop, 4x4 sterile dressing. CI Medication Kit Heparin 40,000 units, Epi 1:10,000, Vasopressin, Steptokinase, Propofol, and Malox for stomach acid neutralization. Assorted syringes for administration. See more.